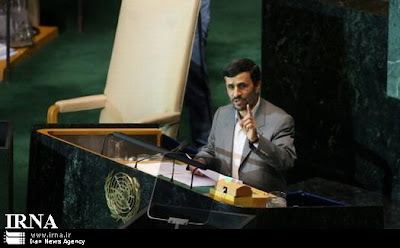 Iranian President Mahmoud Ahmadinejad announced the collapse of the United States and “The Zionist Regime” during his speech to the UN General Assembly yesterday. He announced the return of the Great Prophet, the Hidden Imam, during his speech on Tuesday. “Today, the Zionist regime is on a definite slope to collapse, and there is no way for it to get out of the cesspool created by itself and its supporters. The Islamic Republic of Iran, while fully respecting the resistance of the oppressed people of Palestine and expressing its all-out support for it, submits its humane solution based on a free referendum in Palestine for determining and establishing the type of state in the entire Palestinian lands to the distinguished Secretary General of the UN. “A global community filled with justice, friendship, brotherhood and welfare is at hand, as I have elaborated. A community which will tread the path of beauty and love under the rule of the righteous and perfect human being, the One promised by all divine prophets and the One who is the true lover of humanity. A community that will be devoid of any fear, despair and privation. “Such a community will soon be ours. The community promised by the great divine Prophets Noah, Abraham, Moses, Jesus Christ and Mohammad (PBUH) is about to materialize. “Let us, hand in hand, expand the thought of resistance against evil and the minority of those who are ill-wishers. Let’s support goodness and the majority of people who are good and the embodiment of absolute good that is the Imam of Time, The Promised One who will come accompanied by Jesus Christ, and accordingly design and implement the just and humanistic mechanisms for regulating the constructive relationships between nations and governments. “Oh great Almighty, deliver the savior of nations and put an end to the sufferings of mankind and bring forth justice, beauty, and love. Unfortunately, this talk by the Iranian nutjob did not stop delegates from treating him like a rockstar.